Corneal Flash Burns: What Are the Causes? What Should I Ask the Doctor about Corneal Flash Burns? What Medications Treat Corneal Flash Burns? What Is the Prognosis for Corneal Flash Burns? Eyes, particularly the cornea (the clear window of tissue on the front of the eyeball), can be easily damaged by exposure to ultraviolet radiation from the sun and from other sources of ultraviolet light, such as a welder's arc, a photographer's flood lamps, a sun lamp, or even a halogen desk lamp. The cornea takes the brunt of the damage if proper eye protection is not worn, such as dark glasses or goggles while skiing in bright sun. A corneal flash burn (also called ultraviolet [UV] keratitis) can be considered to be a sunburn of the eye surface. The cornea covers the iris (the colored part of the eye), focuses light on the retina, and protects deeper structures of the eye by acting like a windshield to the eye. The corneal surface consists of cells similar to those in the skin. The cornea is normally clear. the sensation of a foreign body in the eye. In most cases, both eyes are involved, although the symptoms may be worse in the eye that received more ultraviolet radiation. This is very different from a corneal abrasion due to an injury, where, ordinarily, only one eye is involved. Because the eyes are very sensitive to disease and damage, any blurred vision, change in vision, or worsening eye pain needs to be evaluated by your ophthalmologist (a medical doctor who specializes in eye care and surgery). If you are unable to discuss your situation with an ophthalmologist and you have changes in your vision, have blurry vision, see flashing spots or light, or have worsening eye pain or pain with the movement of your eyes, then you need to go to a hospital's emergency department for an evaluation. Have you found a reason for my symptoms? Will I develop any scarring or permanent visual loss from a corneal flash burn? Is there anything I should do to prevent this injury from happening again? What can I expect to feel once the numbing eyedrops have worn off? To make the diagnosis, your ophthalmologist or the physician in the hospital's emergency department will take a history, examine your eyes, and discuss recent exposure you may have had to ultraviolet light. Your vision, eyelids, pupils, and back of the eye are checked. Your ophthalmologist looks at the surface of your eyes using special equipment, such as a slit lamp, made especially for examining the eye's surface. 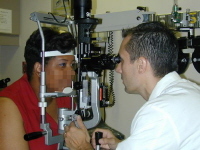 An ophthalmologist examines a patient's eye with a slit lamp. In some cases, the eye may be patched to aid in healing and pain control. Wearing sunglasses may also help relieve the pain. Treatment may involve pain medicine, antibiotics, or medicine to enlarge (dilate) the pupils. Depending on your situation, any combination of these treatments, or none of them, may be indicated. Topical antibiotic eyedrops or ointment made specifically for the eye may be recommended to prevent infection in the damaged cornea. Some ophthalmologists may use steroid eyedrops to reduce inflammation and to avoid potential scarring. A short-acting drug may be used to paralyze the ciliary muscles of the eye, resulting in a fixed and dilated pupil. This drug would be used to rest the muscles of the eyes, as well as to decrease pain from eye muscle spasms. Oral medication can be used for pain control. Pain medication may be an anti-inflammatory pain medicine, such as ibuprofen (Motrin, Advil) or naproxen sodium (Anaprox). Other pain medicines, such as acetaminophen (Tylenol), may also be used; rarely, stronger agents may be used. Topical anesthetic drops for the eye should never be used other than for the exam itself because they can slow the healing of the cornea and lead to ulcer formation. In most cases, you will need to follow up with your ophthalmologist in 24-48 hours for a reevaluation of the eyes and to make sure that the corneas are healing. To prevent damage to the cornea, wear protective eyeglasses that are coated to protect the cornea from ultraviolet light. Labels on sunglasses indicate the level of ultraviolet A (UVA) and ultraviolet B (UVB) protection. a welder's mask when welding. The cornea repairs itself rapidly and usually heals without leaving any scars. In most cases, healing takes place in 1-2 days if you follow all instructions and protect your eyes from further damage. However, some complications, such as infection, may not show up right away. Thus, it is important to return for a recheck with your ophthalmologist when it is scheduled.